Reader Andrea sent over a long list of foods that start with D, including Deviled Eggs to be added to D week! How clever. I never would have thought about that, but it’s perfect. We came up with these little deviled eggs. Perfect for an after school snack, or even a school lunch. <a class="alignnone" title="deviled eggs lunch" href="
Slice hard boiled eggs in half. Pop the yolks out. Mash the yolks with mayo, veggies, mustard and salt. Return to the hollowed out egg whites. Sprinkle with paprika and serve. Use olives or sea-weed paper to decorate. So, I’m thinking about E week. I’d love your ideas on healthy things that start with the letter E. So far I have, Eggplant, Eggs, Endive, Edamame, and Exercise. 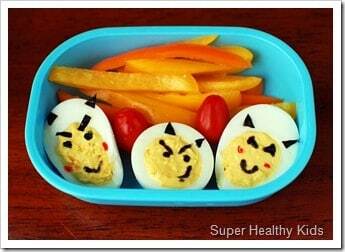 We love deviled eggs and hard boiled eggs, just made some on Monday with dinner. Congratulations on selling all your plates, that’s awesome. You are doing an important job here with informing us and helping us keep our family’s healthy. Thank you for all your hard work. Looking forward to some egg recipes, and edamame. I’ve never made anything with edamame before.